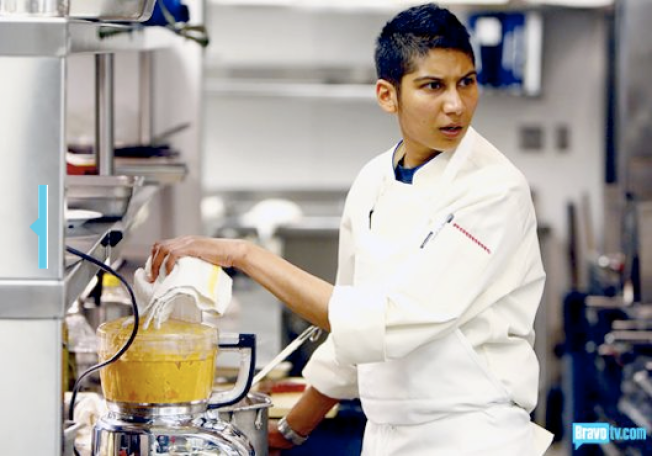 Google chef Preeti Mistry is a contestant on Bravo's "Top Chef." What's the difference between a clam and an oyster? If you're on the reality TV competition "Top Chef," it would be good thing to know. Unfortunately, contestant Preeti Mistry, who also happens to be Google's executive chef, made it clear that she had no idea. In the first challenge of the new season, contestants were required to open clams as part of a relay race. The 33-year-old Cordon Bleu graduate made a major blunder by asking if a clam was the same as an oyster (it's not), tried to shuck them as though they were, and took so much time in the process that she cost her team the win. "Less than 24 hours until clams casino!" "Top Chef premiere tomorrow night...my hands are getting clammy!" "Sneak preview of Top Chef premiere on BravoTV.com. I'm clamming up!" Here's what's confusing about Mistry's seemingly novice mistake: On a bio page maintained by Bon Appetit Management Company, the company which caters to Googlers and actuallly employs her, Mistry talks up her seafood stew made with "local clams and mussels." Or is it oysters? So hard to tell.